Winter may have arrived a little late this year, but Lake Tahoe’s XC ski and snowshoe trails are now covered with snow, with even more on the way. 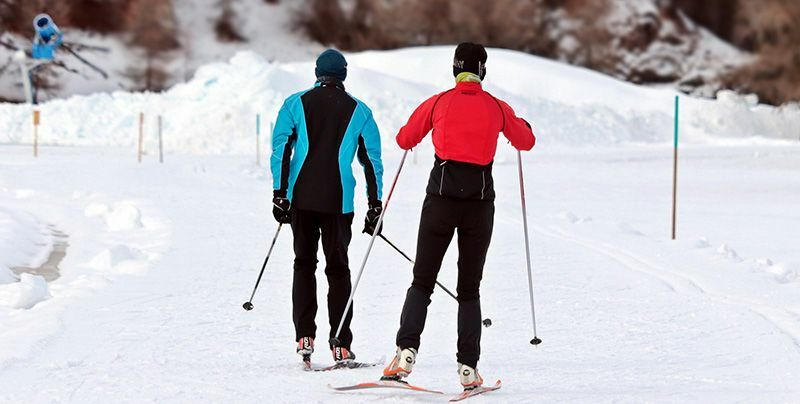 The Lake Tahoe region has hundreds of miles of summer hiking and mountain bike trails that are transformed in winter to a XC skiing and snowshoeing wonderland. There are many groomed trails and off-track trails for all fitness and skill levels to enjoy serene views, fresh air and get that heart pumping. 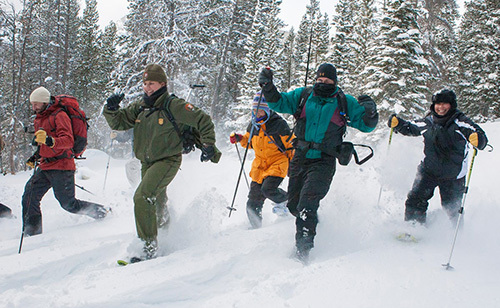 Royal Gorge is the largest cross-country ski area in North America, featuring 92 trails with over 140 km of groomed, tracked trails for human-powered outdoor recreation spread across 6,000 breathtaking acres. There are several warming huts and dog-friendly trails, as well as terrain suited for all ages and ability levels. Lessons and rentals are available. And if you need to feed the beast, the fish tacos from the Summit Station Cafe are a must. Tahoe XC has roughly 65 km of skate and classic tracks that are groomed daily. The 21 trails meander through forest and meadows and offer great views of the lake. There are 8km of dog-friendly trails and 3 trailside warming huts complete with hot chocolate and tea. Lessons and clinics are available throughout the season. This is a very family-friendly resort with a knowledgeable, professional staff. Camp Richardson The Mountain Sports Center in historic Camp Richardson is located in South Lake Tahoe. This family-friendly resort has miles of groomed trails right at lake-level for all levels and offer gear rentals for all ages. 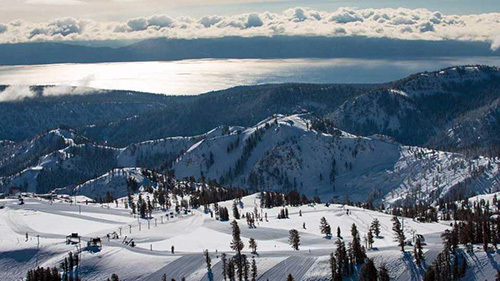 Many of Tahoe’s downhill ski resorts offer XC ski and snowshoe trails with all the amenities. Here are a few favorites. Tahoe Donner Tahoe Donner Cross Country Ski Center, voted one of the top 3 XC ski resorts in North America (USA Today), has 100km of groomed trails over 2,800 acres of beautiful Sierra terrain. There are 7km of dog-frinedly trails and some trails are even open to fat bikes. Top-of- the-line rental equipment is available, as well as lessons by expert ski instructors. Tahoe Donner staff is always great and particularly helpful in the XC center. The Alder Creek Cafe has a fresh, delicious menu to end your day or to grab a quick snack. Squaw Valley Cross Country Course offers 18km of pristine, groomed trails over 400 acres through Squaw Valley Meadow. The scenery is gorgeous and there are trails for all skill levels. Rentals and group and private lessons are available. At Sierra at Tahoe you can rent snowshoes and poles for $27 and get access to miles of beautifully maintained snowshoe trails. Enjoy self-guided trails that wind through scenic Sierra terrain on Blizzard Mountain and take in the fresh air and tranquility you’ll find there. Take the gondola at Northstar Ski Resort to the family-friendly Cross Country, Telemark and Snowshoe Center. There are trails for all skill levels and they offer some of the best views you can find. Rentals, lessons, guided group tours, and private guided tours are available as well as special events and workshops. The Tahoe Meadows sits at 8,500 feet and receives a good amount of snow. The terrain provides easy meadow trails and a moderately challenging hike through the forest to Chickadee Ridge where you can take in stunning views of Lake Tahoe. Tahoe Meadows is popular, so parking can be limited. If you’re looking for an expert-level trail, try Mount Tallac. If you plan to conquer Tallac, you’ll have to contend with over 3,000’ of elevation gain and a lot of exposure, but the views cannot be topped. At Emerald Bay, take the trail down to Vikingsholm. This approximately 1-mile trail is a fairly easy hike down and takes you right down to the lake, but be prepared for that 400 foot elevation change on the way back up. Centrally located in South Lake Tahoe, Bijou Park is mostly flat and great for beginners. For a more challenging hike, higher into the mountains, begin at a Forest Service gate on Pioneer Trail or at the end of Oneidas Street. Snowshoeing off the Highway 89 & Highway 88 area boasts early and late season snowshoeing due to its higher elevation. Grass Lake and Hope Valley are mostly flat, but Big Meadow and Carson Pass Sno-Park (permit required) offer more challenging routes. Looking for a quick and easy trail with lake views? Check out Donner Memorial State Park and try one of the snowshoe trails that winds through the park to Donner Lake or into Coldstream Canyon. And be sure to hit the visitor center, which provides information on the Donner Party, Native Americans and the importance to American history of this corridor that contains Interstate 80 and Highway 40. 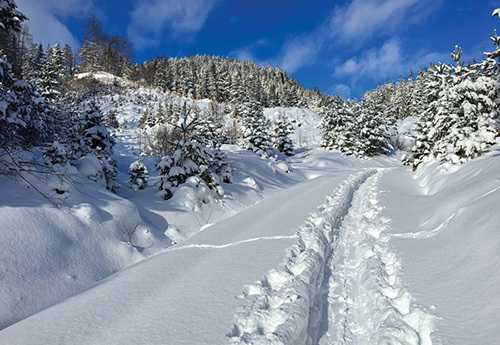 If you’re new to snowshoeing or xc skiing or maybe just want some company while you’re on the trail, there are some great guided tours available. They offer gear, have knowledgeable guides and unforgettable adventures for all levels. Check with the local weather service before you head out. 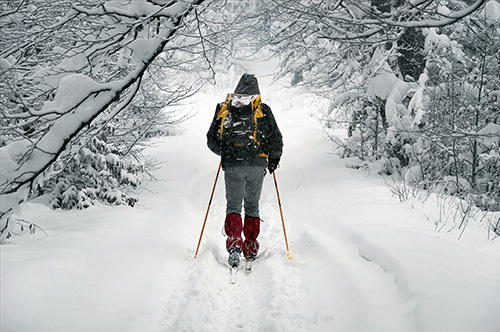 Conditions can sometimes change quickly, so bring proper clothing layers. Stay hydrated and go at a pace appropriate for your skill and fitness level. Make sure someone knows where you will be going and your expected time of return, even if you will be out with a group.